I’ve started keeping a running list of inspirational businesses, which I share with you below. Please check out the links to their websites, their short videos, and the articles written about them. Reading their stories makes you feel like, heck, if they did it, what’s stopping me from trying?! These businesses inspire me because they started small, using whatever resources and skills they and their friends and families had. They incorporate the personal stories and passions of their founders.They take into account the wellbeing of their customers and their ingredient providers. They inspire me because now, they are growing big. I hope they all have continuous success to sustain their businesses! Sometimes it can be better to do one or two things really well than do many things with mediocrity. These companies occupy a niche, which allows them to perfect what they do and offer something truly superior. 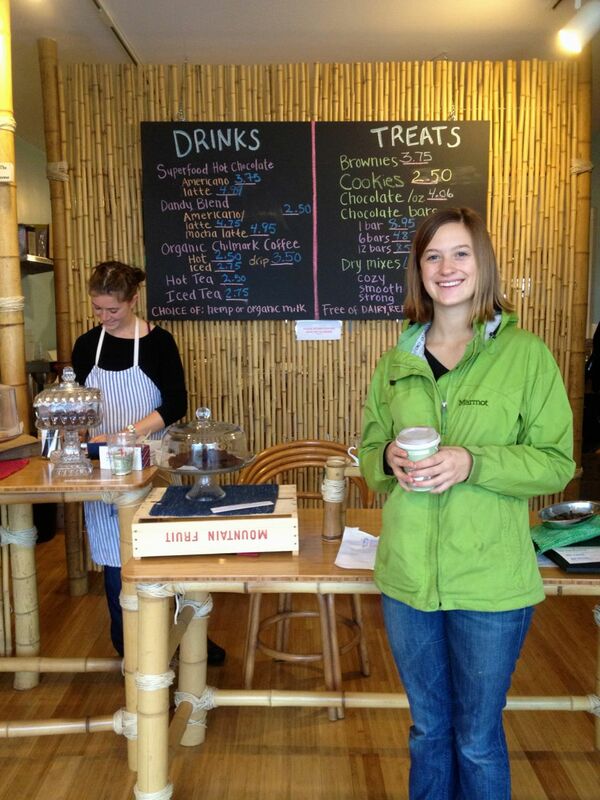 Emily, with her (very first) hot dandy blend, in Not Your Sugar Mamas. Thanks to Ali and Sam Berlow, we at Edible Vineyard have an account there–brain food! Back to the Roots. Mushrooms. These two college kids just went for it. They created mushroom growing kits from what would have gone to the landfill as waste. Nikhil Arora and Alejandro Velez were not intimidated by barriers to success, or success itself. Check out the video. Madecasse Chocolate. Chocolate. Bean to bar, the chocolate is made and packaged in Madagascar, where the founders, Brett Beach and Tim McCollum, were both Peace Corps volunteers. Quoted from their website, “70% of the world’s cocoa comes from Africa, less than 1% of chocolate is made there.” Local takes on a new meaning through this company. Farmers learn to ad value to their crop, and jobs are created to make the cocoa into chocolate and to package it in Madagascar. More revenue, at least 4X more, is generated in Madagascar by keeping chocolate making and packaging production local. Everything is local to somewhere, and cocoa is much more local to Madagascar than it is to anywhere in the United States. Makes sense, then, that they make their own chocolate, right? Check out this article for a review on how it tastes, and for more info on the company. Mast Brothers. Chocolate. “Beauty.””Childlike Curiosity.” “Voyage.” “Literary.” Rick and Michael Mast use these words, in this video, to describe their work. They even said they try to create an inconsistent product, meaning they want a uniqueness to each bar, and each paper wrapper. They are inspiring to me because of their huge success. Try the flour less chocolate cake at Diner, made with their chocolate, if in Williamsburg BK. Bars can be bough at Le Roux in Martha’s Vineyard. Brooklyn Kombucha Company. Kombucha. First of all, they call it ‘buch. Kombucha makes me feel good. They are family run. It started by experiments in a Brooklyn apartment. They sell Kombucha on tap! Siggi’s Icelandic Skyr. Yogurt. The yogurt is thick and tastes good. It could be used on baked goods instead of clotted cream. The ingredients are high quality. Even their flavored yogurts are low sugar. They have an orange and ginger flavor. Yeah. They make baby, and I mean really small, drinkable yogurts that are probiotic, due to the live cultures inside. Their packaging rocks. Not Your Sugar Mamas. Raw Chocolate and other sweet treats that are packed with nutrition, and use alternative sweeteners to white sugar. It is run by two women, Ky and Bennett. It is based on Martha’s Vineyard, where they have a cozy, delicious-smelling storefront of their own, but they also sell products on the mainland. Try their hot dandy blend, velvety and decadent but not too sweet, made with hemp milk, their special hot chocolate blend, and the caffeine-free coffee substitute made from dandelion and other edible roots. Chilmark Coffee Company. Coffee. Todd tells his story simply. He wanted to make some extra cash and so he started roasting coffee. Now it’s his full time job. Their coffee is sold everywhere. They are making coffee as local to MV as it can get, by roasting the beans here. They sell pour over coffee at the farmers’ market, and their set up there is nifty.